There have been complaints by MMM participants against the MMM Guiders. Most of these complaints is about the Guiders not doing their Job well. Other participants complain that Guiders ignore those under their structures. Still others complain about the huge Guider bonuses for doing nothing. But, there is good news. MMM Launches a new campaign that makes the participants alpha and omega. The participants now have more power compare to the Guiders. Dear participants! 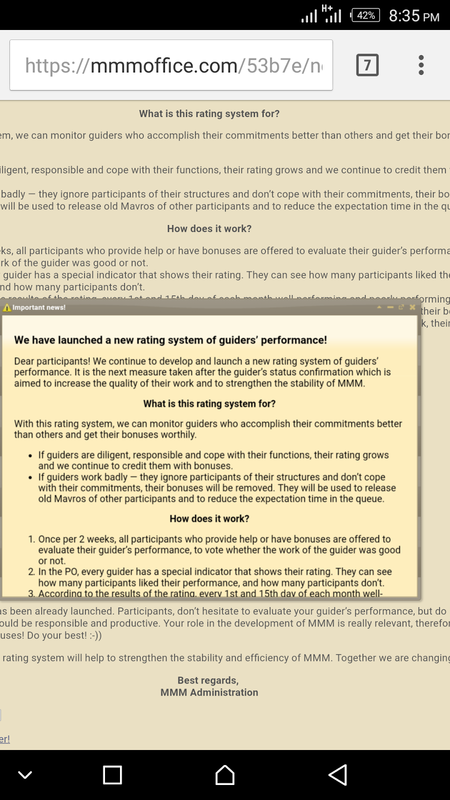 We continue to develop and launch a new rating system of guiders’ performance. It is the next measure taken after the guider’s status confirmation which is aimed to increase the quality of their work and to strengthen the stability of MMM. What is this rating system for? With this rating system, we can monitor guiders who accomplish their commitments better than others and get their bonuses worthily. If guiders are diligent, responsible and cope with their functions, their rating grows and we continue to credit them with bonuses. If guiders work badly — they ignore participants of their structures and don’t cope with their commitments, their bonuses will be removed. They will be used to release old Mavros of other participants and to reduce the expectation time in the queue. Once per 2 weeks, all participants who provide help or have bonuses are offered to evaluate their guider’s performance, to vote whether the work of the guider was good or not. In the PO, every guider has a special indicator that shows their rating. They can see how many participants liked their performance, and how many participants don’t. According to the results of the rating, every 1st and 15th day of each month well-performing and poorly-performing guiders will be defined. If guiders work well and have more positive marks, they will get the respective message and get their bonuses. If they have more negative marks, they will get the message calling them to work better. For the inefficient work, their bonuses will be removed and they will lose their status of guider. The rating system has been already launched. Participants, don’t hesitate to evaluate your guider’s performance, but do it in a fair way. Guiders, you should be responsible and productive. We are sure that this rating system will help to strengthen the stability and efficiency of MMM. Together we are changing the world!